After passing by the gruesome animal carcasses on hooks, we were a little apprehensive about having our lunch there. Luckily, we did not eat at any of the restaurants along that row. Our tour guide Nam Nam brought us to another restaurant a little further. Walking up the steps, we could see many stalls on the left side. 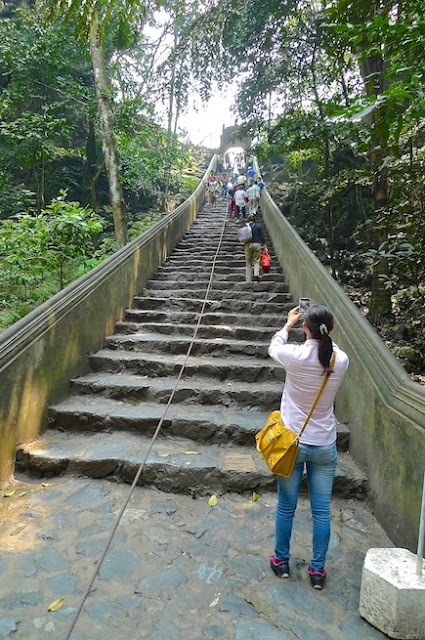 Perfume Pagoda is a popular tourist attraction, but it is said to be very crowded with local pilgrims during the first two to three months after Tet (Vietnamese New Year according to the Lunar calendar). I would advise not visiting during those months (usually from January till March every year) unless of course, you are one of those people who enjoy the madness of a peak period. I am not a crowd person so frankly, I was a bit worried that it would still be crowded with worshippers as it was just the first week of April. As it turned out, I had nothing to worry about. We had lunch at Mai Lam Restaurant. Our not-so-adventurous fare. Definitely thankful there's no dog, deer or porcupine on the plate! During lunch, we debated on whether we should hike up the mountains or take the cable car to reach the pagoda at the top. I had fun talking to everyone in our tour group. I asked a German tourist in our group to guess which country I was from and he said Malaysia. Surprised, I asked how he knew and he told me that he could guess just by listening to the way I speak English! Gosh! It was then that I noticed that both my friend and I were the only Asians talking in distinctive Malaysian English. The Indonesian Chinese couple spoke English like Americans, and so did Nam Nam, our Vietnamese tour guide. There are actually many pagodas (I heard about 14!) all over the area, but Nam Nam said he would only bring us to the main one inside a cave at the top of Huong Tich Mountain. I guess once you have seen one, you have seen all. To get to the top, we can either hike up or take the cable car. My friend and I decided to go up using the cable car and then walk all the way down on the return journey. In this way, we could experience both the cable car ride and the hiking on the mountain. In fact, all of us except for two ladies (from Canada I think) took the cable car ride up. It was a wise decision because the two ladies later told us that there was nothing to see on the way up as the views were all blocked by souvenir shops and tents! This is the cable car station at the base of the mountain. The cable car ticket was priced at 80,000 VND (about US$4) one way. I thought that was quite pricey especially if you need to take the cable car on the way down as well, which most of them did. However, I had no regrets taking the cable car ride as we could watch the beautiful mountain-side scenery from the top. Some pictures I took from the cable car. Was I glad I did not hike up the mountain! Halfway the journey, the cable car reached another station. Here, I was surprised to see lots of cash strewn on the floor! According to Nam Nam, these were money thrown by pilgrims to cleanse their sins. I wondered who collect all the money on the floor later. Leaving the station, and the money, behind. More beautiful views and scenery from the cable car. I have a fear of heights, but somehow I did not feel fearful during the ride. Maybe because I was too busy taking pictures there was no time to let the fear of heights took over me. Finally, after about 15 minutes or so, we reached the top of Huong Tich Mountain. Alighting from the cable car, we walked over to what looked like a very long staircase. 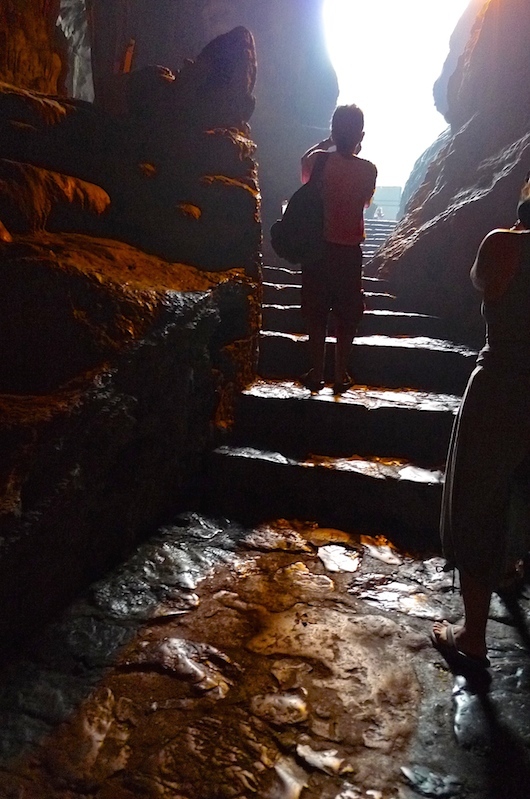 This stone-slabs staircase leads to the cave below. View of the stairs from the bottom. 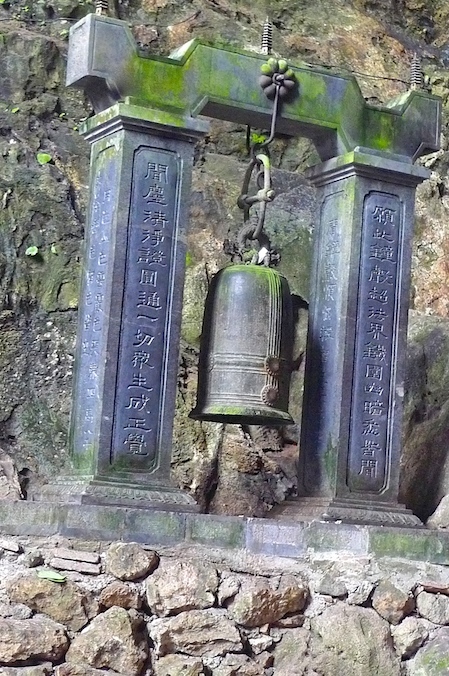 There were numerous shrines inside the natural cave. I have to say that the cave was pretty huge! The floor was wet and slippery and I had to walk very carefully to avoid slipping and falling. The cave was filled with incense and candles. Tourists taking pictures as usual and I took a picture of them taking picture. LOL. There were a lot of locals offering prayers at the shrines. Luckily, it was not too crowded. I can't imagine how it would be like if I were to be there during Tet celebrations. I walked around for about 20 minutes and then I wanted to leave. Yes, I wanted to leave. Because, honestly, I was not impressed. 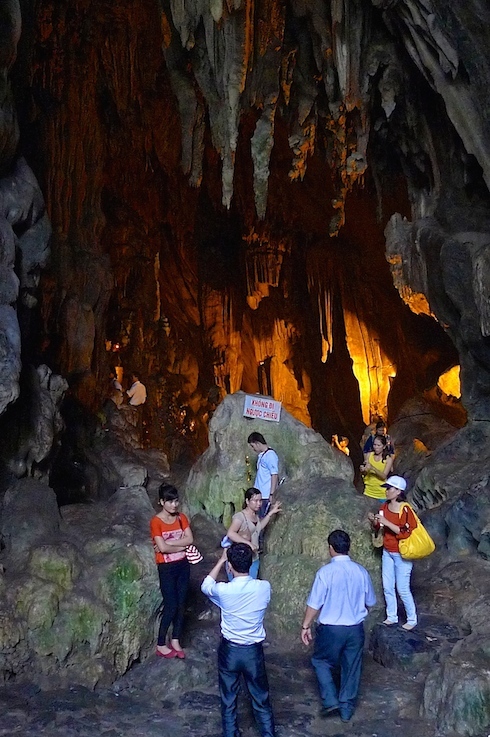 I mean, if this is a major tourist destination as claimed in most of the travel brochures and online, then it must be the most hyped destination in all of Vietnam! There, I said it! And I like the cable car ride although it's still nothing much to shout about. But the temples inside the cave - what's the big deal with that? Not to put down their temples or having any disrespect, but I have seen better cave temples in Malaysia, my home country! I do not need to travel all the way to Vietnam to see this! It was such an anti-climax and a disappointment. I was really glad I did not hike all the way up the mountain to see this cave! While the rest of the tourists in our group took the cable car down, my friend and I decided to walk. But we were in for another disappointment. There was absolutely nothing interesting to see on our way down. Stalls and souvenir tents lined both side of the walkway, effectively blocking off any view of the mountains. How boring. It was already late afternoon by the time we all leave Perfume Pagoda. Back on the boat ride on Yen River. I did not particularly enjoy this boat ride compared to the morning session, maybe because I had seen the scenery earlier and also it was quite hot under the afternoon sun. Ironically, this boat ride was still way more enjoyable than visiting the Perfume Pagoda. If there is any trip where the journey is more interesting than the destination, this must be the one! We saw another smaller shrine along the river. Come to think of it, no wonder the tour agent only brought us to the main pagoda. If the main pagoda is already quite a let down, why should we even visit the rest of the pagodas? I used to take pictures of my leg and shoes whenever I travel inside a boat, so here's another one! Haha! When we reached Duc Village, we had an unpleasant experience with our lady boat rower who insisted we pay her more tips and only in US dollars. You have of course read about this in Part 1, but if not, go read about it HERE. Thereafter, we took the bus for another 3 hours journey (including a short stop at a souvenir shop) back to Hanoi. So would I recommend a visit to Perfume Pagoda? I would say no. I feel it's more like a domestic tourist spot - more suited for locals than foreigners. Maybe it should not even be marketed as a tourist attraction! But if you like to go on a scenic boat ride and see first hand porcupines being hung on hooks and ready to be cooked and eaten, then maybe, this trip is for you. Just don't expect to be impressed by anything and you should do pretty fine.